Whether it’s a few cans left from last season, or something that was forgotten in the back of a locker, or sometimes even being away from the boat for a month in a humid environment, rusty cans happen to all of us. Do you have to throw them away? 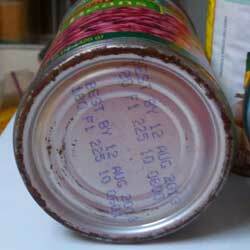 According to the FDA: "Discard heavily rusted cans. Cans that are heavily rusted can have tiny holes in them, allowing bacteria to enter. Surface rust that you can remove by rubbing with your finger or a paper towel is not serious. You can keep these canned foods. If you open the cans and there is any rust inside, do not eat the food. Rust (oxidized iron) is not safe to eat." The Canned Food Alliance (a trade group for manufacturers of canned goods) says: "Rust or dents do not affect the contents of the can as long as the can does not leak. If the can is leaking, however, or if the ends are bulged, the food should not be used." I'd add that you should probably wipe away as much rust as possible from the lid, so that when you cut the lid off, loose "rust dust" doesn't fall into the can (I don't have any source for that, just my own comment). As with anything else when you're away from prompt medical care, use common sense and don't push it too far. If you have any suspicion that a can is unsafe (rusted or dented so that bacteria could enter), don't eat the food in it. Food poisoning is never fun, but it can be extremely serious when medical care is a day or more away.